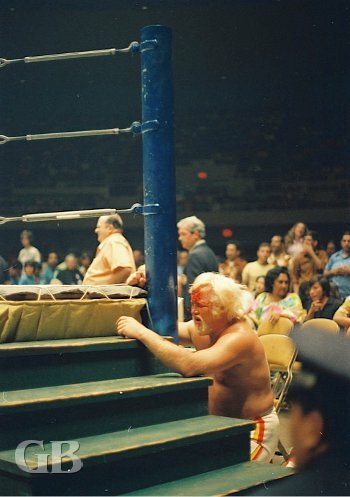 On february 16, 1972 Promoter ED FRANCIS presented a wrestling card at the Honolulu international Center Arena featuring three main events and four other matches. In the opening match Pat O'Brien and Hahn Lee battled to a draw. In other matches Jimmy Snuka defeated The Stomper, Sam Steamboat stopped The Mighty Brutus, and Jack Bence over Chuck Richards. In the first main event, Gene Kiniski defeated Ed Francis to become the new Hawaiian champion. 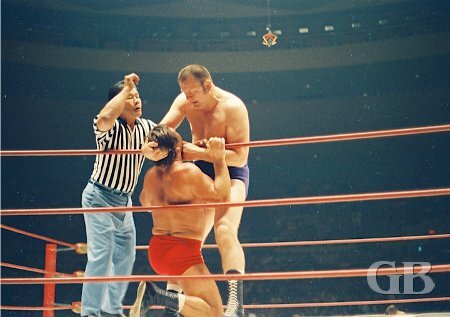 Gene Kiniski has Ed Francis in the ropes as referee Wally Tsutsumi tries to break it up. In a match advertised as Battle of the Dogs, featured Maddog Mayne vs. Maddog Vachon. According to the rules, both wrestlers would be chained neck to neck. This match came about from a tag team match a few weeks earlier where Mayne and Vachon were tag team parters against Johnny Barend and Jimmy Snuka. During that match Mayne accidentally hit Vachon, the punch was intended for Snuka. Maddog Vachon tugs on the chain that binds him to a whimpering Maddog Mayne. Maddog Mayne strangles Vachon in the corner with the chain. Maddog Mayne won this night's hard fought and bloody Battle of the Dogs match, making him Top Dog. Mayne about to deliver a fist full of chain onto Vachon's forehead. All hell breaks loose as referee Wally Tsutsumi takes a tumble. 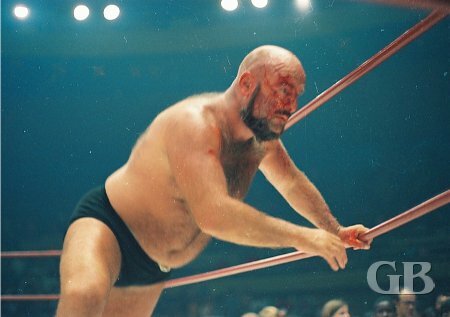 A bruised and bleeding Maddog Vachon readies himself for more punishment. A vicious Maddog Vachon wraps the chain around Mayne's eyes while outside the ring. Maddog Mayne, with his head busted open, struggles to get back into the ring. The main event was a tag team match featuring Johnny Barend & Bobo Brazil vs. The Sheik & Sweet Daddy Siki. 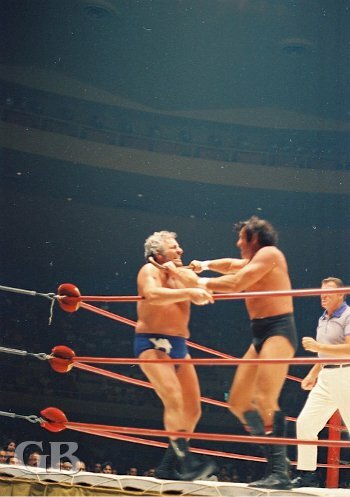 The match ended in a no-contest when both teams were disqualified for fighting with each other outside the ring. The Sheik chomps a mouthful from Johnny Barend's forehead. Johnny Barend answers the Sheik with a cane to the throat. 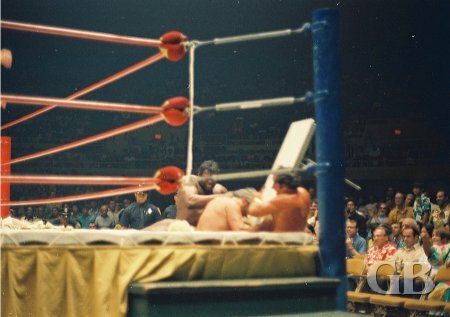 The Sheik uses a foreign object on Johnny Barend while Bobo Brazil tries to get the referee to stop it. Sweet Daddy Siki and The Sheik work over Barend. Johnny Barend lofts a ringside table onto the Sheik's head. 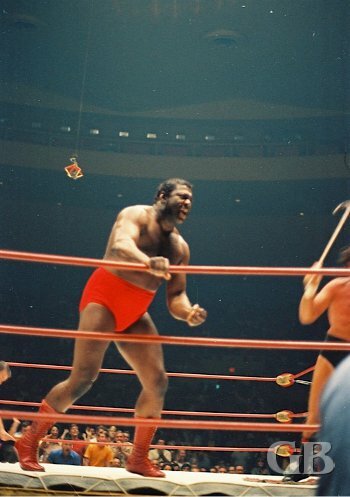 Bobo Brazil charges as team mate Johnny Barend flails away with his cane.